Pioneers in the industry, we offer batch printing machine/ mrp printing machine and automatic rewinder machine from India. We hold a complete aptitude offering a best quality scope of Batch Printing Machine. These machines are tried against different quality parameters by our talented quality reviewers before conveying them to our customers. Aside from this, our prestigious customers can profit these modernized clump printing elastic stereos at most reasonable and efficient rates in the business sector. 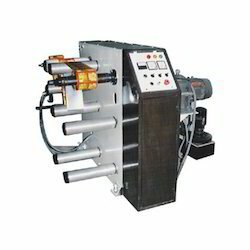 We offer a comprehensive assortment of Automatic Rewinder Machine to our valuable clients. Our team of highly skilled professionals fabricate this machine using optimum quality components and the latest technology. 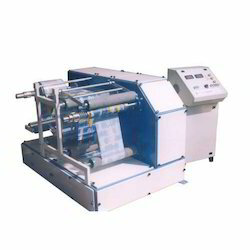 Furthermore, this machine is used in various industries in order to wind films, papers and foils. We are providing this machine at reasonable price to our esteemed clients within promised period of time. With Hydro-Pneumatic edge guide system. In built encoder for constant linear speed. Automatic Hologram Applicator Attachment System. Roll: Laminated Roll, Paper Roll Etc. Max Rewinding up to 400 mm Roll Width. Motor / Power: 2 H.P. 3 phase. / Power 2.5 Kw, 3 Phases. Rewinder Speed up to 150 mtr. Per min.